I just put it on layaway at Gander Mtn. for $299 with tax and 1 year warranty . I was just wondering if I got a good deal . I would say it is in very good condition . maxx BTW It is stamped Highway Patrolman . I paid $225 for mine about 12-15 years ago. A set of rosewood fingergroove grips will offset the blueing nicely, IMO. A great deal on a really nice handgun. You are gonna love it. Thats a decent enough price, maxx. The 28 IS the "Highway Patrolman", the name of the gun before they had model numbers. The 28 is a utility version of the N frame .357, without the high polish and other finish features found on the Model 27. It was created because LE wanted the features of the N frame .357 without the price. 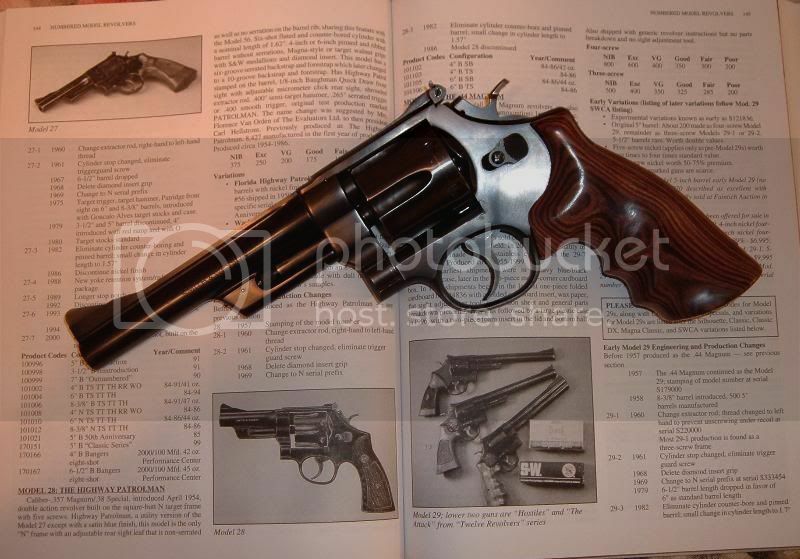 But it is a great revolver, and should give you a lifetime of servce if you take care of it. A set of rosewood fingergroove grips will offset the blueing nicely, IMO. $299 really is a buy it if you can price. Hmmm gotta get them out and take new photos sometime. I like 28s so much that they're on my "by at will" list. In fact, I just bought my second. Keep an eye out in the EE. The example I illustrated above is going up for sale in the near future.